In the area of 18 Slovenian municipalities, we have between the years 2009 and 2012, in the form a public – private partnership, constructed key operated open broadband networks , which we now manage, maintain and rent to service providers for end users. All networks where constructed with the use of the most modern optic (FTTH) technology, which, considering today’s needs, enables literally unlimited speeds of data transfer. In the years 2009 and 2010, we have, in 18 months, constructed open broadband networks in Mislinja and Drava valley (municipalities Slovenj Gradec, Mislinja, Muta, Radlje ob Dravi, Ribnica na Pohorju, Vuzenica and Vuhred) and in the municipalities Ormož, Sveti Tomaž and Središče ob Dravi. In this time, we prepared the complete project documentation (idea projects and implementable projects), acquired the necessary consent and permits, constructed over 1.300 kilometres of cable sewers and installed over 1.600 kilometres of optical cables into it, as well as produced comprehensive technical documentations (projects of carried out work). 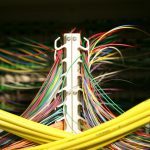 In the years 2011 and 2012, also within 18 months, we have constructed broadband networks in the municipalities Mokronog – Trebelno, Mirna peč, Trebnje, Mirna, Šentrupert, Žužemberk, Sevnica and Slovenske Konjice. Within these projects, we constructed over 1.100 kilometres of cable sewers and laid over 1.300 kilometres of optical cables into it. We took all constructed networks into management and maintenance for the period of 20 years, within which we rent the networks to service providers for end users and thus increase personal investment into the project, as well as covering the running costs of network operation.